Light therapy is an advanced technology that offers a vast quantity of benefits for the skin without chemicals, drugs, or invasive measures. There are a number of different colored wavelengths that help the skin in various positive ways. Once the light is absorbed into the skin, the different colors work hard offering their unique benefits such as skin rejuvenation, increased blood flow, wound healing, pain relief, acne treatment, and stimulation of collagen and elastin production. Red LED light has the ability to reach deep into all your skin’s layers to stimulate collagen production, prompt cellular repair, and increase circulation leaving you with a more vibrant and youthful complexion. This light an ideal anti-aging treatment for those deep lines, wrinkles, scarring, and to obtain an even skin tone. 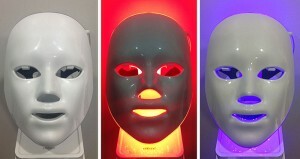 Blue LED light has powerful anti-bacterial properties that have the ability to kill the acne causing bacteria, p acnes. It prevents and treats mild to moderate acne, purifies the skin, soothes inflammation, and stabilizes oil glands.